Tiger Trust organized a Medical Camp for the forest officials at Sariska Tiger Reserve on 28th February 2016. Tiger Trust attended and participated in the 3rd Asian Ministerial Conference on Conservation of Tigers held at Vigyan Bhawan from April 12-14 2016 in collaboration with Tigers For Tigers, Clemson University. Tiger Trust India celebrated the GLOBAL TIGER'S DAY on July 29, 2016 at ASN Senior Secondary School, Delhi with a roar. Around 700 students attended the Program and participated in competition organized by the Trust - Slogan Writing, Poetry Writing, Book Mark Presentation, etc. 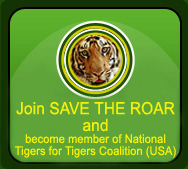 Tiger Trust presented certificates to the winners and encouraged youth to save tigers. Tiger Trust conducted its annual awareness campaign at Ranthambhore Tiger Reserve from October 1st - 3rd 2016. 35 students from ASN Senior Secondary School participated in this event. Students from the local schools of Sawai Madhopur also participated in the event and shared thoughts and ideas on the topic of conservation of nature and wildlife. In March 2015, Tiger Trust organized “Save the Roar”, a three day workshop with 80 students from Symbiosis Law School (Noida, Delhi), 13 students from Clemson University (USA) and other supporters with total of around 100 participants. Tiger Trust initiated conservation awareness program “Save the Roar” on August 4, 2015 at Ryan International, Gurgaon. A Nature Walk was organised with the school students of Ryan International, Sohna Road to Aravalli Biodiversity Park, Vasant Vihar. Total 40 students of VI, VII & VIII standard participated in this Nature Walk, accompanied by the teachers, Tiger Trust staff and Nature Education Officer. Tiger Trust initiated Wildlife Week 2015 Nature Walk was organised with the school students of ASN Sr. Sec. School, Mayur Vihar, Delhi- 91, to Aravalli Biodiversity Park, Vasant Vihar on 1 October’ 2015. Total 40 students of VI standard participated in this Nature Walk, accompanied by the teachers, Tiger Trust staff and Nature Education Officer of the staff. Tiger Trust organized a Conservation Awareness Campaign named SAVE THE ROAR 2015-16 on August 31, 2015 at ASN Senior Secondary School. A total of 80 students from standards VI and VII respectively attended the event. Tiger Trust organized Save the Roar 2014 with students from various schools in New Delhi, Rajasthan, including Vasant Valley School, New Delhi, Janta Balika school, Sawai Madhopur, Tagore Public School, Jaipur and MPS, Jaipur. Students from Clemson University, South Caroline, USA also attended the event. Tiger trust is happy to inform our members and readers that the founder director of PROJECT TIGER, our dear Late Shri Kailash Sankhala is among the seven persons who have been selected by the Government of Rajasthan for RAJASTHAN RATAN AWARD 2013. The award ceremony held on 2 September 2013 at Jawahar Kala Kendra Jaipur.The honour was done by the State Governer.